I am completely fascinated with Day of the Dead (Dia de los Muertos). The All Souls Procession, here in Tucson, Az , is one of the most amazing things about Tucson. It’s a really amazing event. I went last year, despite an aching back and was so glad I went! 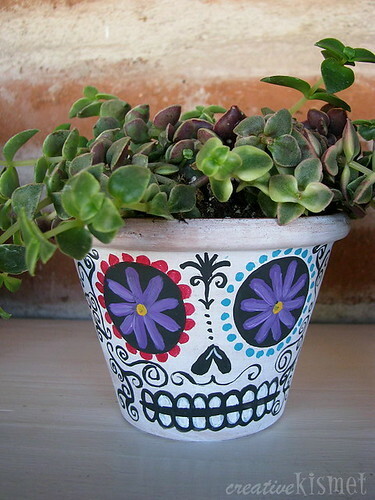 I made these Day of the Dead Calavera (skull) planters. I thought the plants would make great hair or fancy hats. Sugar skulls, and other decorated skull like things, are given to the living and the dead. It is similar to giving valentine’s as a way to say, “I love you forever”. I thought these would make great decor for a DOTD party or given to friends/family as gifts to celebrate life. 1. 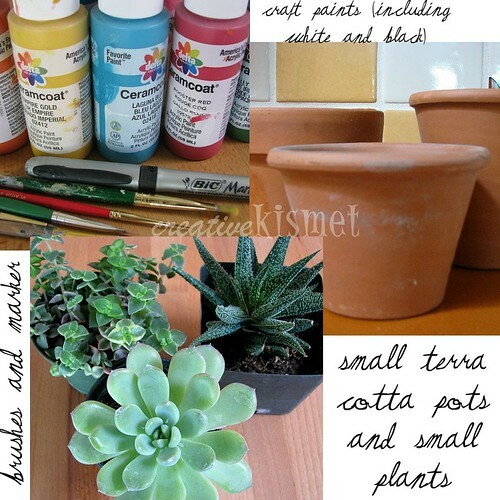 Thin out some white paint with water and so a white wash over the pots. Dry. 2. 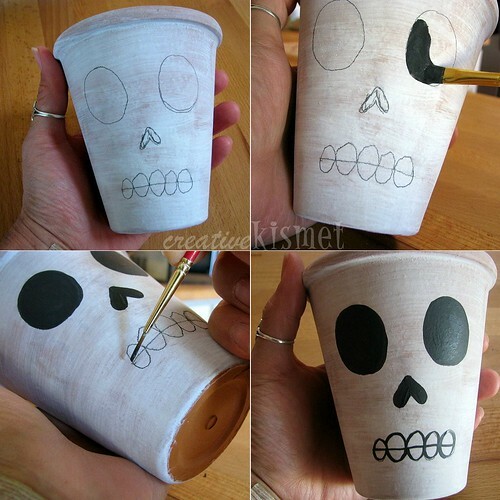 Sketch out your skull face, then fill in with black paint. Leave as is, or go to the next step. 3. Add colorful designs and use a black paint or a black marker to add swirly curly cues. 4. Pot your plants. I used succulents, but marigolds would be great too. Marigolds are also known as Flor de Muerto (“Flower of the Dead”) which are thought to attract souls of the dead to the offerings (or altars). This entry was posted in i make stuff, Tutorials, how to. Bookmark the permalink. love them! great job Regina. 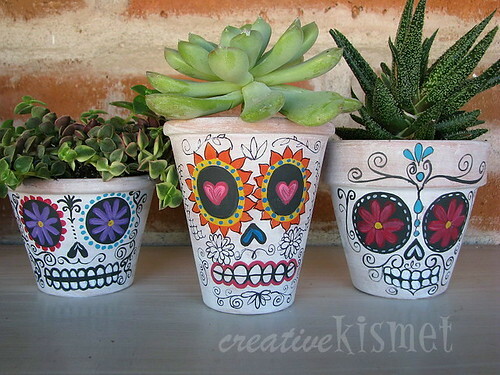 you totally make me want to get some planters and paint and get to work! These are so fun! What a great project. I love these! What a great idea! Oh, they are fantastic! You are so creative! Thank you so much for posting this project. I was just online looking for different ways to introduce my boys to Dia de los Muertos. These are perfect. Thanks again. Love, love these. I live in Tucson and am a HUGE fan of the All Souls Procession. I am gonna make some of these this weekend. These are beautiful! Am thinking of making as gifts for xmas! I love this post and your awesome pots! Great job and super idea! Thanks for sharing! Thanks! Love this! I made these tonight and they are really impressive. Thank you for the perfect inspiration. 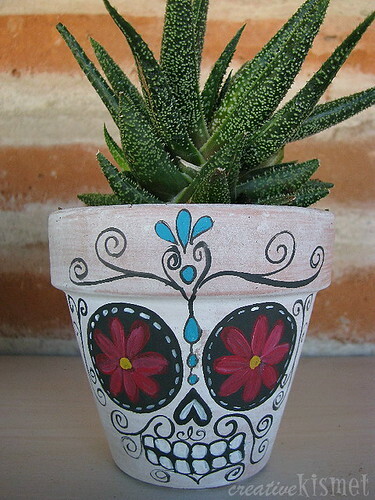 I love sugar skull art, and I happen to have a blue ridge aloe plant that needs a pretty pot, so this is perfect! 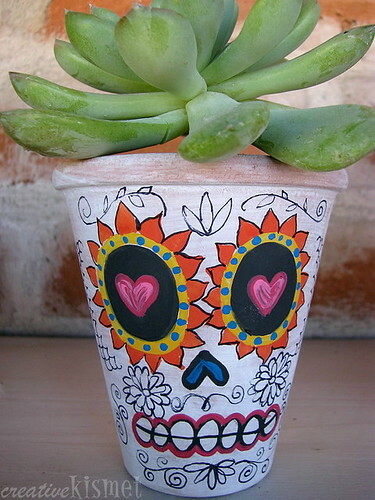 I hope you had a lovely Día de los Muertos celebration. I found the lovely picture of your planters on Pinterest and made my own version. Since I will post a tutorial on my blog about it, I was wondering if you would like to be mentioned as “my inspiration”. I would like to link to this post and use your first photo if you allowed me to. What do you think?